The Majority of our Den Meetings and Pack Meetings are graciously hosted by the our Sponsor, Our Lady of Guadalupe (OLG) Catholic Church. Classrooms 5 & 6 are reserved on MOST Thursdays from 6:30-7:30. Please check your Den's calendar for specific information for that week. 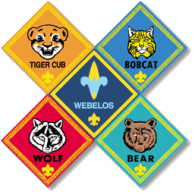 McGimsey Scout Park is the location of several of the Council Camping & Training events including Outdoor Leader Training, BALOO Training & Webelos Outdoor Training to name a few! McGimsey Park is located behind the Musselman Scout Shop (Our local scout store). In Castlehills (San Antonio) at intersection of Lockhill Selma & N. W. Military Drive. McGimsey Scout Park includes over 150 acres with a lake and has 15 separate campsites.